Next Big Idea Club selection―chosen by Malcolm Gladwell, Susan Cain, Dan Pink, and Adam Grant as one of the "two most groundbreaking new nonfiction reads of the season!" "A must-read that topples the idea that emotions don't belong in the workplace." * Be selectively vulnerable: Be honest about how you feel, but don't burden others with your deepest problems. * Remember that your feelings aren't facts: What we say isn't always what we mean. In times of conflict and miscommunication, try to talk about your emotions without getting emotional. * Be less passionate about your job: Taking a chill pill can actually make you healthier and more focused. Liz Fosslien is a strategy and design consultant who has worked with companies including Salesforce, Ernst & Young, and the Stanford d.School. Liz's work has been featured on or by the Economist, Life Hacker, the Freakonomics blog, and NPR. Mollie West Duffy is an organizational designer at IDEO New York. She has helped companies and start-ups such as Casper develop good workplace culture. She writes a blog about start-up culture, and has written for Quartz and the Stanford Social Innovation Review. 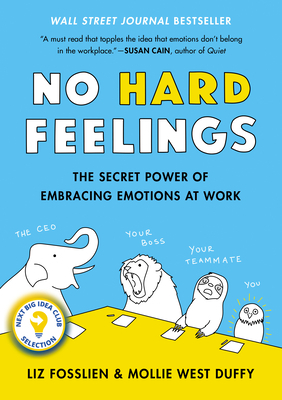 "A must-read that topples the idea that emotions don't belong in the workplace, No Hard Feelings offers a path towards a future I want to work in: an emotionally expressive, yet respectful (and high-performing!) workplace." --Laszlo Bock, CEO of Humu and author of Work Rules! "Don’t send another email, attempt a serious conversation at work, or try to follow your intuition until you read this book. Your emotional intelligence at work is about to skyrocket. Equally valuable for the person who cries covertly in bathroom stalls and the kind who buries their emotions 20,000 leagues under the sea." "The avenue for success and happiness at work, even life, lies with emotions. Liz Fosslien and Mollie West Duffy do a phenomenal job of helping us see the way." "No Hard Feelings is one of the most original, insightful, and laugh out loud funny business books I've read in a long time. It will transform the way you think about the role of feelings in the workplace."